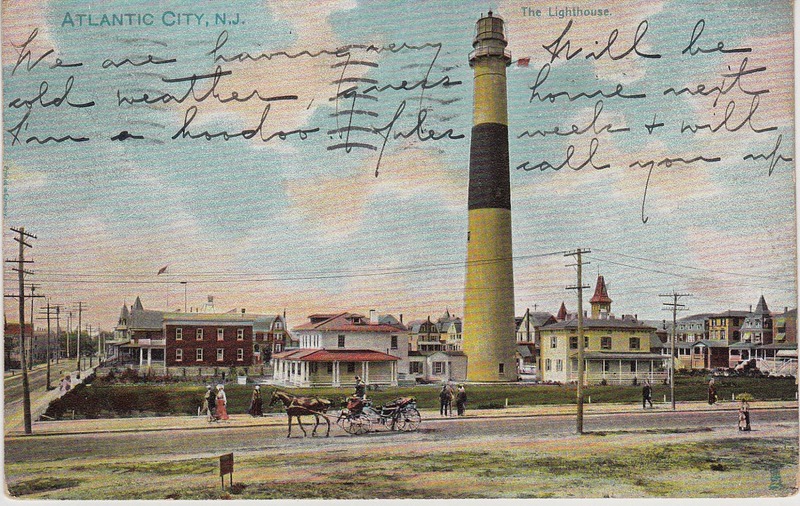 Shining the Light on Atlantic City: Absecon Lighthouse ~ The History Girl! When you think of Atlantic City, New Jersey the first things that come to mind are casinos, Miss America, and Boardwalk Empire. But just within sight of the boardwalk and towering casinos is another type of tower - the Absecon Lighthouse. The nation's third tallest lighthouse has been protecting the shores near Atlantic City since 1857, long before the bright flickering lights and tall edifices disrupted the once unobscured view of the sea. In a time before Atlantic City legalized gambling, this seashore resort had one very popular attraction at its northern end - so popular, the lighthouse keepers argued with the U.S. Lighthouse Service to allow visitors to tour the structure! Beginning in the 1830s, Dr. Jonathan Pitney, considered by many to be the "father" of Atlantic City, petitioned the federal government for placement of a lighthouse at Absecon Inlet on the northern end of what would become Atlantic City. Despite a resolution passed by the New Jersey Legislature, the Treasury Department, which managed and oversaw lighthouses, ignored and denied the requests. The denials continued until the early 1850s, when the U.S. Lighthouse Board was enacted in 1852. This board would oversee all lighthouses, their planning, and management. The area around the Absecon Inlet had been known for a number of shipwrecks, of which the most notable was the Powhatan, which ran aground on the shoals off the coast of south of Beach Haven, Long Beach Island on April 15, 1854. The ship, carrying 300 German emigrants, had encountered a storm. The following day, the ship broke apart and all the passengers and crew perished. An inferior lighthouse had existed at Barnegat at this time, but south of it no lighthouse marked the dangerous shoals off the coast. Between 1847 and 1856, at least sixty-four ships were lost off the coast of Absecon Island. Since 1695, the area had been affectionately been called "Graveyard Inlet." Four months later, in August of 1854, $35,000 was appropriated by the federal government for the creation of the coastal lighthouse on Absecon Island. It was the first of nine first-order lighthouses to be constructed by the federal government during the 1850s. On December 5, 1854 land was purchased from the Camden and Atlantic Land Company in the amount of $520.00. Construction began in 1855, under the direction of Major Hartman Bache. Bache was replaced by Lieutenant George G. Meade, the tower's architect (and would later command the Union Army at Gettysburg). Colonel William F. Raynolds took over the project in 1856, and saw it to completion in late 1856. The original $35,000 was insufficient and an additional $17,436 was needed to complete the site, which would include the tower, two keeper's dwellings, and multiple outbuildings. The final cost of the lighthouse, rising 171 feet, was $52,436.62. It was the tallest lighthouse ever built in New Jersey. Meade's brick masonry tower design is a double-walled structure consisting of a conical outer wall and cylindrical inner wall, which intersect approximately ten feet below the watch room. Stone brackets support the watch tower gallery deck. At the base of the lighthouse, the diameter is twenty-six feet, four inches. As the tower rises, the thickness tapers to one foot thick at the top, containing 598,634 bricks. The iron staircase contains 228 steps to the watch room with an additional twelve steps to the lantern room. A view of the Absecon Lighthouse first-order Fresnel lens. The lighthouse was lit for the first time on January 15, 1857 with a Funck's mineral oil (kerosene) lamp focused through a stationary first order Fresnel lens, visible for 19.5 nautical miles. The first keeper was Daniel Scull, who was paid a yearly salary of $600. Two assistant keepers were hired at a salary of $520 and $340. During the 1870s, severe erosion led to water coming with seventy-five feet of the lighthouse base and washed away a portion of the fence surrounding the site. Jetties were constructed near the base of the tower in order to build up the beach. Over time, the jetties proved successful and the beach in front of the lighthouse grew. Since then, the cyclical effects of erosion have naturally removed and added sand to the inlet but have not approached the levels seen in the 1870s. Between its initial construction and its decommissioning, the lighthouse property served host to a number of U.S. government agencies. Two life-saving stations were built, the first in 1871 and the second in 1884. In 1901, the U.S. Department of Agriculture Weather Bureau constructed regional weather service offices on the property. Other various outbuildings on the property have included two keeper's dwellings, outhouses, an oil storage house, sheds, and a greenhouse. Just as it is popular with tourists and families today, the lighthouse has been no stranger to having crowds climb up and down the spiral staircases for breathtaking views of the Atlantic Ocean. 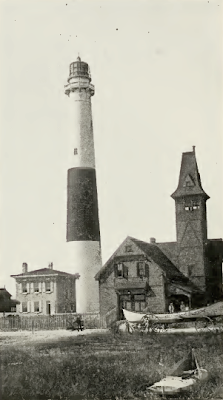 Atlantic City, being a popular seashore tourist community at the turn of the twentieth century, entertained throngs of visitors there to look at the gardens, climb the tower, and ask questions of the lighthouse keepers. In 1912, the Bureau of Lighthouses in Washington, DC sent an inspector to investigate the happenings at Absecon. Upon his arrival, he found that the lighthouse had 13,000 visitors annually, making it the most visited lighthouse in the United States. Despite the visitors being a "great nuisance" to the operations of the lighthouse and the keepers, he reported to Washington that it was a great public service and educational experience for the public. Absecon Lighthouse and life saving station, circa 1900. On June 6, 1910, the lighthouse was converted to an incandescent oil vapor lamp, and finally to electricity on July 1, 1925. After 76 years of service, on July 11, 1933 the lighthouse was decommissioned. The decision to decommission the lighthouse was due to the fact that the usefulness of the structure was diminished by multi-story hotels and bright lights of a burgeoning Atlantic City nightlife. The lighthouse has had a number of color schemes or "day-marks" throughout its history. The tower, when initially completed in 1857, was not painted and retained its natural brick appearance. In 1871, the tower was painted white, bisected with a red band. In 1898, the tower was painted orange with a black band, which it kept until 1907, when the orange sections were changed to yellow. In 1948, the tower again changed colors to white with a bisecting blue band, which lasted until sometime in the early 1970s when the blue band was changed back to red. During restoration in 1998, the yellow color with the bisecting black band, was restored. Between its decommissioning in 1933 and 1946, the federal government leased the property to the City of Atlantic City for use as a park. The federal government formally transferred the deeds over to Atlantic City in 1946. Around this time, the two keeper's dwellings were demolished. A small visitor's center was built at the base of the tower in 1962, and on December 31, 1963, Governor Richard Hughes relighted the lens for the first time in twenty-five years for New Jersey's tercentenary celebration. View from the top of Absecon Lighthouse, looking north toward Brigantine. In 1964, Jack E. Boucher (September 4, 1931–September 2, 2012), an Atlantic City native who worked ten years earlier advocating preservation, for local newspapers and radio programs, left his job as Chief Photographer for the Historic American Building Survey to supervise New Jersey's State Historic Preservation program. He conceived and oversaw the preservation of Absecon Lighthouse in 1964. In 1970, he left New Jersey and returned to the National Park Service, accumulating over 50,000 images of historic sites in his 50+ year career. 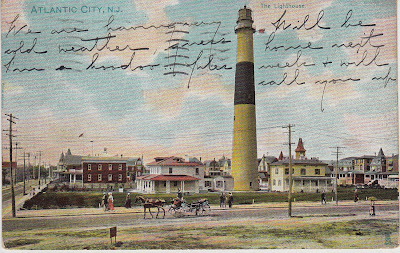 Atlantic City retained ownership of the lighthouse until 1966 when the city turned the property over to the State of New Jersey, being unable to afford the continued maintenance costs. The lighthouse was placed on the New Jersey and National Registers of Historic Places in 1970 and 1971, respectively. In 1994, the nonprofit Inlet Public/Private Association took responsibility of the lighthouse to ensure its continued preservation for future generations. The association was able to secure grants to begin the planning for a full restoration of the lighthouse. Restoration, which started in 1997, included the rebuilding of the lost keeper's dwelling. However, on July 6, 1998, just a few weeks away from completion, the rebuilt keeper's house was completely destroyed by a fire. The restored tower opened to the public in 1999 while the damaged keeper's house was being rebuilt. In October 2001, the rebuilt keeper's house opened to the public. In 2007, the lighthouse celebrated its 150th anniversary to much fanfare as a guiding light amongst the tall buildings and twinkling lights of a city that never truly sleeps.